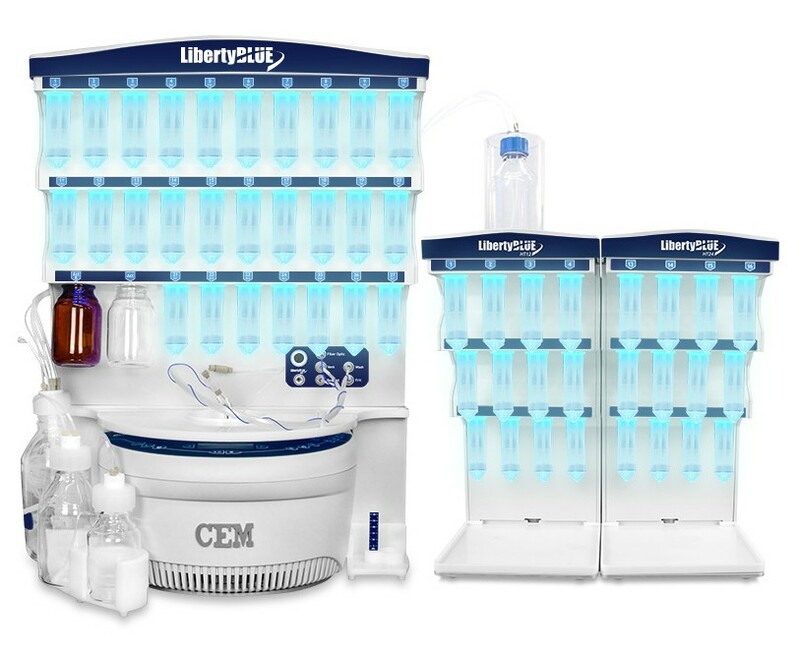 The Liberty Blue™ System is an automated microwave peptide synthesizer designed for Fmoc solid phase peptide synthesis. The system is capable of automated synthesis of a single peptide. The standard synthesis scale is 0.005 - 5 mmol using a 30mL reaction vessel. The Liberty Blue™ uses a Discover single mode microwave reactor that provides for self-tuning with a continuous power delivery from 0-300 Watts in 1-Watt increments. The system contains 20 ports standard for amino acids, 7 additional unusual amino acid ports, and 4 external ports for other reagents. All reagent deliveries are controlled by nitrogen pressure. Amino acid, activator, and activator base are delivered with the Flex-Add technology allowing for precise and accurate delivery. This configuration incorporates the HT24 Resin Loader, allowing the Liberty Blue System to synthesize up to 24 peptides sequentially. NOTE: This product configuration features a Discover microwave reactor with a 240 V power supply. For those countries using a 120 V power standard, order PN 925614.